Under a firm layer of heavy dark clouds, over 25 cars flashed down through Abbey to officially begin the 2017 season of the FIA World Endurance Championship with the traditional Tourist Trophy. Toyota was viewed as the favorite by many but it proved to be a much closer contest at the sharp end, a situation that was echoed all the way down the grid in what can only be described as an exciting six hours of racing. 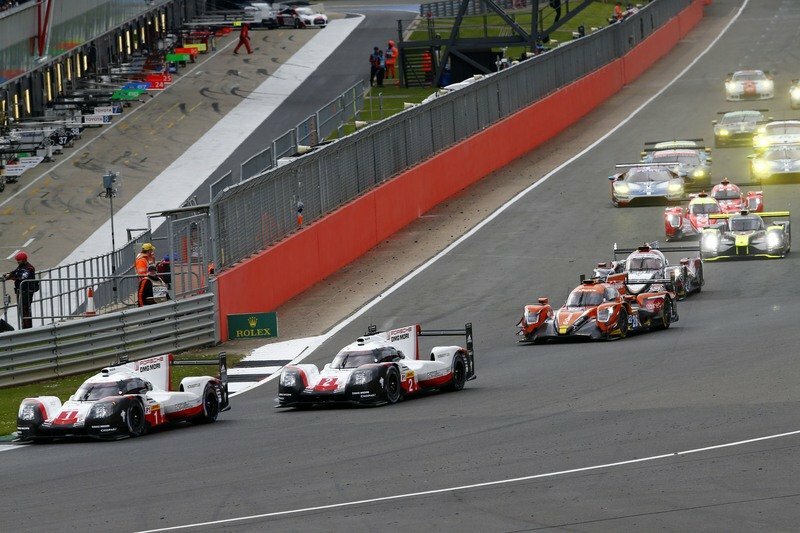 In the preview I laid down late last week I decided to keep my wits about me regarding Toyota’s advantage against Porsche coming to Silverstone. As I mentioned in that piece, Toyota opted to debut its high-downforce aero package while Porsche brought its Le Mans-ready, low-downforce package. 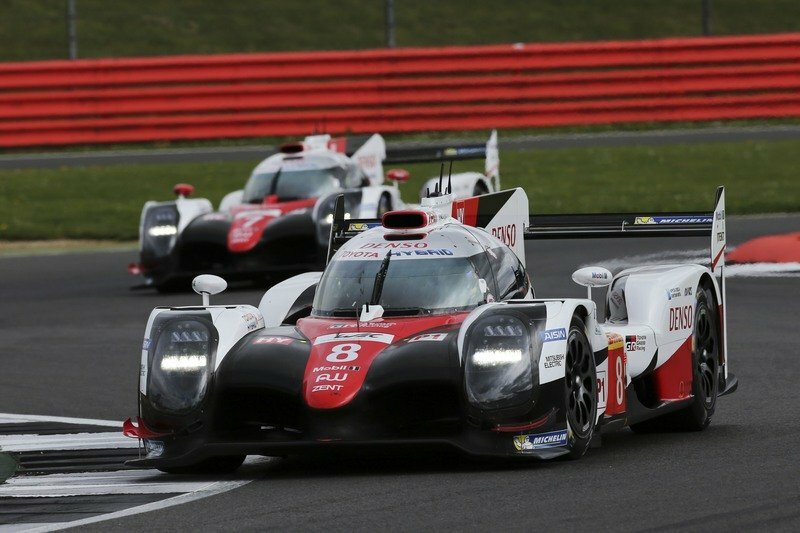 With Silverstone not being anymore the super fast airfield track it once was, Toyota’s added downforce should have given the Japanese-German outfit the upper hand by a clear margin over the reigning World Champions. Qualifying showed that this could be the case but the race was a different kettle of fish. Toyota Gazoo Racing was coming into qualifying off the heels of dominating all the way through free practice. This was to be the norm in qualifying as well, Kamui Kobayashi managing a a personal best of 1:36.793 to put the No. 7 TS050 in pole. After debutant Jose-Maria Lopez’s turn at the wheel, the car dropped to fourth, but Mike Conway brought it back to P1 thanks to a sturdy 1:37.800 that put the trio’s average at an unbeatable 1:37.304. The other TS050 was close behind, Buemi, Nakajima and Davidson sharing front row with their average of 1:37.593 that surpassed Porsche’s best average by over a second. That time was managed by the No. 1 crew while the No. 2 919 was almost half-a-second behind. If the gap between Porsche and Toyota was to be expected, less so was the huge leap down the order to find the ByKolles – the only non-hybrid P1. Yes, the Nissan-engined car was never thought to be a threat to the front-runners, but it was even beating four P2 ORECAs! 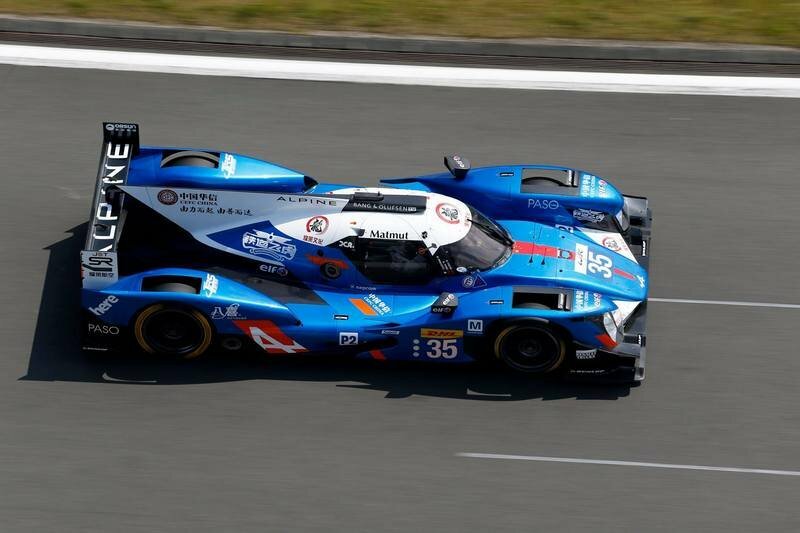 Pierre Thiriet and 2017 Sebring 12 Hours winner Alex Lynn got pole in LMP2 for G-Drive racing, their 1:44.387 average being less than a tenth quicker than that of Nicolas Liperre and Matt Rao who put Alpine on the front-row in the virtually spec secondary prototype divison. Jackie Chan DC Racing’s No. 38 ORECA was third via a 1:44:591 that was below the best that any of the two Vaillante-sponsored Rebellion crews could do. 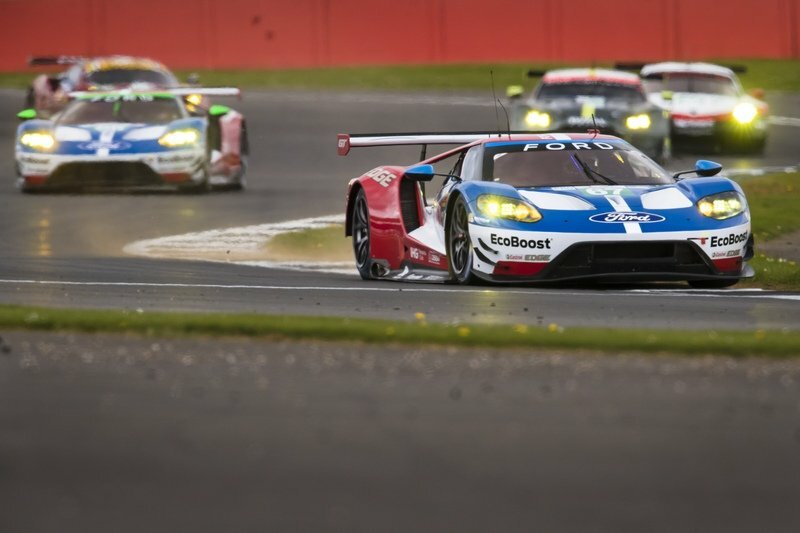 Ford dominated GTE-Pro qualifying with Priaulx and Tincknell pleasing the home crowd with an unrivalled 1:56:202 average time between the two of them. 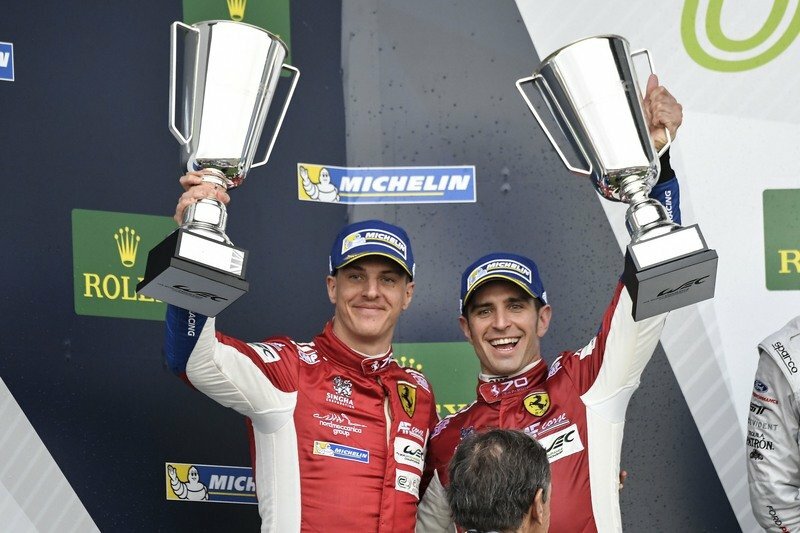 Sam Bird and Davide Rigon were roughly eight-tenths-of-a-second behind for AF Corse in their No. 71 488 GTE. Third was the venerable Vantage of Thiim and Sorensen who partnered for a 1:57:117 average that would have been slower than that of the No. 66 Ford if Stefan Mucke wouldn’t have had his best lap deleted for exceeding track limits. As it was, Mucke and Co. started fourth in the other GT run by Chip Ganassi Racing UK. It was Porsche who found themselves lacking pace, the new mid-engined 991 GTE qualifying seventh and eight. Portugal’s Pedro Lamy teamed up with Paul Dalla-Lana for yet another pole position in GTE-Am. This time, the No. 98 Vantage beat the Spirit of Race Ferrari and the No. 77 Proton Racing Porsche. With the starting order now set in stone or, rather, set on the time sheets, it was all about the race. Under the watchful eyes of FIA President Jean Todt – probably reminiscing of his Peugeot days in the early ‘90s – all cars lined up for the flying start on Easter Sunday; It was an important moment for Toyota. If they were to dominate Porsche it would signal that their high-downforce package was working well enough to probably withstand whatever Porsche will be bringing at the Nurburgring. If, on the other hand, Porsche were to stick close to the TS050s in spite of their clear lack of wing, it would mean that Toyota would have to turn up with a brilliant low-downforce setup to bag the only races it is truly useful at – Spa, Le Mans and Fuji. The reasons for that are obvious: if a low-drag Porsche can stay with a super-winged Toyota, then it’s easy to image that a properly-equipped Porsche for the technical tracks that will line up in the second half of the season will blow the TS050 out of the water. Yes, it’s true that Toyota is eyeing that elusive Le Mans win first and foremost, but losing the title when they only have one rival to take care of wouldn’t go down well with the suits in Japan either. The start was quite clean, everybody going through the first couple of corners without major drama as, at the front, Conway managed to stay ahead of team-mate Buemi. The two then proceeded to break away from the works Porsches that fell roughly five seconds back before the Toyotas hit traffic. By that time, though, it was Buemi leading the way as he’d made his way past the No. 7 on the International start/finish straight. Clouds got darker up above and some sprinkles of rain started to appear on the windscreens of cars. It happened right at the time of the first round of pit stops for the leaders but it wasn’t enough to make the teams to switch for the intermediate compound. With the stops completed, it was still Buemi leading from Conway with Hartley and Jani following suite. The two Toyotas fought for the lead almost all the way through the second hour as well. Conway got ahead at first but ultimately lost the lead again towards the end of the second stint when Buemi got by in Stowe. It wasn’t, however, all plain sailing in the No. 7 camp as Kobayashi lost time on his out-lap after taking the car over from Conway – team blaming an electrical gremlin for it. But problems did not end there as Kamui radioed complaining about the car’s behavior on the 3.66-mile-long track. 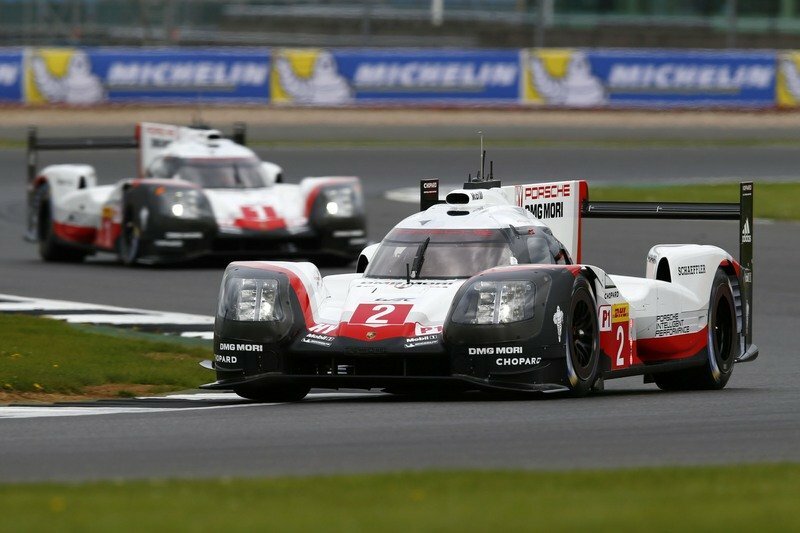 This meant that Porsche was able to jump to second and third behind leader Anthony Davidson. After tracking down the issue to a loose anti-roll bar, Toyota Gazoo Racing decided that the No. 7 TS050 needed a new rear deck as well as fixes underneath it so they set to work the next time Kobayashi stopped. He remained in the car but, as he was coming out, rain started falling and it was heavier than before. This caught the Japanese off guard and he ran straight in Vale, his slicks aquaplaning on their way to the sand bank. By that time, Tandy had closed up to Davidson but couldn’t go by before pitting for grooved slicks right after a scheduled stop. It was, however, unnecessary as the skies started to clear up a little and the rain returned to being just a sprinkle. This aided Davidson to build up a gap which was nearing 50 seconds as the race passed the three-hour mark. The order at the sharp end was shook up with two-and-a-half hours still to go when, with the road still greasy from the previous short showers, Jose Maria Lopez went straight out in Copse corner. It was a frustrating turn of events for the three-time WTCC champion but it wasn’t the end of the race for this ill-fortuned crew. Lopez managed to bring the heavily damaged car – both front and rear – back to the pits and the mechanics – roughly 15 of them at times – buzzed around it for minutes to get it back in acceptable running order. However, he got out of the car and went straight to the medical center because the accident caused the newly-introduced warning light to activate. The system, which features two warning lights outside towards the bottom end of the windscreen, is meant to inform the incoming medical crew that the G-forces of the crash exceeded certain pre-defined limits which makes it a serious shunt. This makes it mandatory for the driver to get a medical checkup which Lopez did before being transferred to a local hospital also as a precautionary measure. Most of the hour was spent under the Audi R8 safety car after the No.7’s accident. 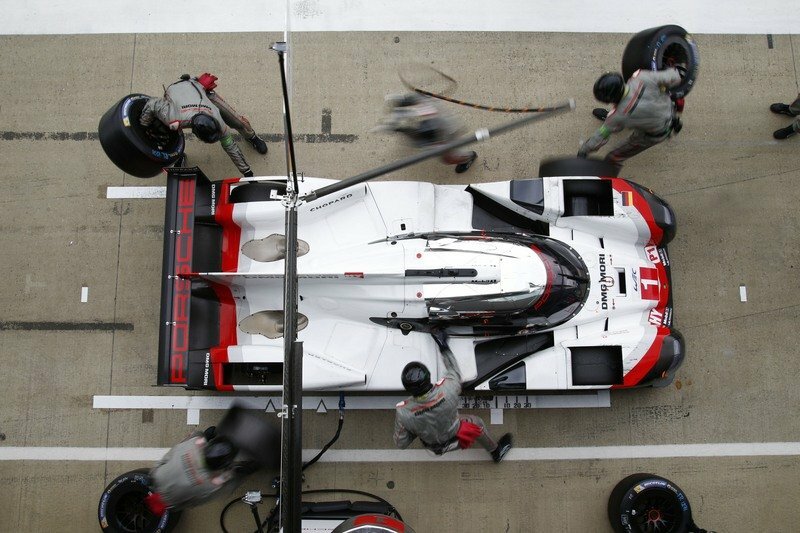 When the green flag was displayed once again, Porsche still had a shot at victory and, due to quicker stops from Porsche and the better mileage of the 919, it was the German brand which was ahead with 30 minutes left to go. But Sebastien Buemi had the fresher tires and soon brought himself back behind Hartley who benefitted from a great drive in the middle of the race by Earl Bamber. Buemi then proceeded to pass Hartley through Village with just 12 minutes left to go. This is the order in which they crossed the line, the No. 8 Toyota ahead of the No. 2 Porsche and the No. 1 Porsche. For the only non-hybrid LMP1 prototype present, the ByKolles, it was a forgettable race. After early problems that pushed the team to keep the car in the garage for repairs for five minutes, the No. 4 came together with Johnny Adam’s GTE-Pro Aston-Martin at the entrance to the pits. Damage the result for both parties and the No. 4 ended up as not classified. Ford officials and drivers spoke, prior to the race, about their surprise concerning their pace in qualifying but most other people in the GTE-Pro paddock weren’t as surprised as the No. 66 and the sister No. 67 led the way in the opening laps. It all went south for the latter of the two which got delayed with front tire pressure problems and an erratic door that opened by itself. Lopez’s crash and ensuing long caution period helped the CGR crew and brought the No. 67 back up and into contention. Luck played its part and a late stop for fuel gave the lead to the Tincknell’s car that was also driven without mistake by both Priaulx and ex-ESM man Pipo Derani. That’s in spite of the sister car’s best efforts and the best efforts of the chasing Porsches and Ferraris, both of which managed to lead due to different pit strategies but ultimately lacked the pace. This last bit – the lack of pace – I guess is something that the not-so-fortunate teams will hope that the Automatic BoP will address. If you want to know more about this 2017 novelty then check my Preview. Going back to the action, Ford’s No. 66 lost out in the final 90 minutes to finish off the podium, behind both the No. 51 Ferrari and the surviving No. 91 Porsche. I say surviving because the other car went out with flames spitting out from the engine bay of the No. 92. Sadly for the Manthey-run team, it was precisely that car, driven by Christensen and Estre, which was the quicker of the two 991s. Still, Makowiecki and Lietz signed off with a podium so that was definitely not the worst of days for the GTE-Pro guys after their total lack of pace (almost two seconds off pole) in qualifying. It was quite the other way around for Aston-Martin. Yes, the quickest of the Vantages qualified third but the two Banbury-built V8-engined cars were nowhere in the race. Both Darren Turner and Nicki Thiim were quite racy early on but as the race progressed, the Astons faded into obscurity. After six hours of racing and a near-miss for the No. 97 with the ByKolles, Aston-Martin Racing left home ground with sixth and seventh in the Pro category. 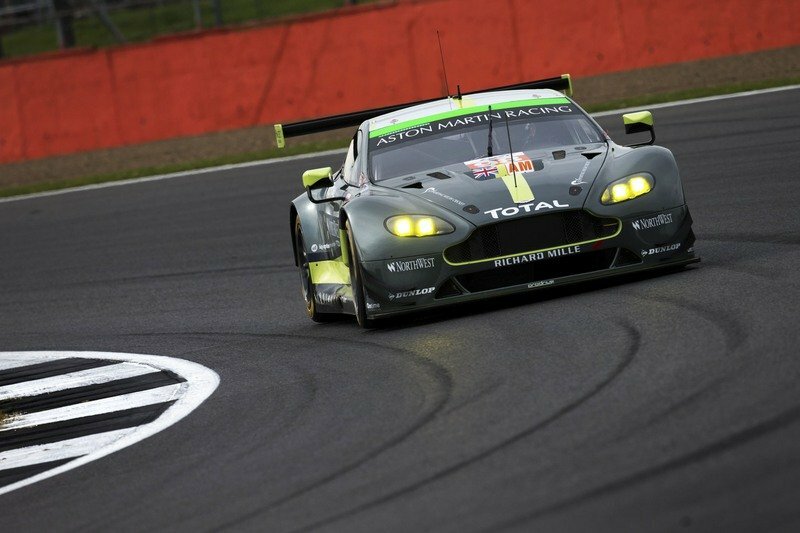 Things were, however, looking brighter in GTE-Am for Aston-Martin, and not only after qualifying. That’s because Mathias Lauda, Paul Dalla-Lana and Pedro Lamy did their job to stay ahead of the slim GTE-Am pack for most of the time. Only at the start did Lamy let the Spirit of Race Ferrari No. 54 go by but from then on it was mostly plain sailing for the trio. That is, if we disregard a couple of spins for Dalla-Lana – at least one of which causing throwbacks for the people back in the box of the Le Mans disaster in 2015 when the Canadian crashed out of the GTE-Am lead with but an hour left to go. Still, the Spirit of Race Ferrari and the Clearwater one were never too far back – also helped by the safety car in hour number four. By that time, Lamy’s lead had shrinked but he was still in control of things. Matt Griffin was, however, all about taking over that control as he was bridging the gap to first. The two finally began to fight for the lead which was exchanged with 20 minutes left to go. But the Irishman needed a bit of fuel to go the distance and Pedro got back in the lead as the Ferrari dropped to third behind Molina’s Spirit of Race entry. The ex-Audi man also began to close on Lamy who appeared short on tires. Going round the final time, Molina caught up with Lamy and tried in audacious move on the inside through Stowe. It didn’t work and the two cars tangled but got going again. Out of all that tire smoke, though, it was third-placed Griffin who emerged first and who went on to win ahead of the stricken Lauda. Sadly for him, Molina stopped road-side with too much damage, giving away P3 to Matteo Cairoli’s No. 77 Proton Porsche. Griffin then flew off to Oulton Park to take part in Monday’s British GT double-header than kicks-off the season. Wanting to make this race report in a somewhat circular fashion, I’ll round things off – naturally! – with LMP2, the lower prototype tier. The race proved to us that the good side of ORECAs stranglehold of the category is that it highlights great drives. Some of this were signed by Jackie Chan DC Racing’s Oliver Jarvis who started cautiously aboard the No. 38 that would go on to win. He detailed the team’s strategy post race, stressing the fact that the Jota-backed squad were aiming to save a couple of sets of rubber to use later on. That’s why Jarvis did not charge through in the first hour while the Signatech Alpine was at the top. The car was, though, kept in contention by the trio completed by Ho Pin-Tung and Thomas Laurent, enough so they can mount an attack after Lopez’s crash. It was Matt Rao ahead at that point but Laurent held on to a close second. The Frenchman lost the second spot with little under 120-minutes after being passed by countryman Matthieu Vaxivier. He then pitted to leave the car in the hands of Emmanuel Collard of Porsche and Pescarolo fame. He took the car to the flag on the last podium spot, behind the No. 31 Rebellion and the No. 38 DC Chan car which, after saving rubber, was able to push hard in the final 90 minutes to lead and win, Jarvis being the man that took the car to the checkered flag.